So I had this idea of Nazi artifact hunters crossed with a Harry Potter-type young hero who inherits one of those artifacts. At the time I was planning on writing a science fiction novel, but when I thought about it… Come on, how could I not write about magicians fighting Nazis? The trouble was that my idea was built on a now tired cliché—the “Chosen One” trope. We’re all familiar with it—the young boy who is given a special power or responsibility, and it his his destiny to use it for good. 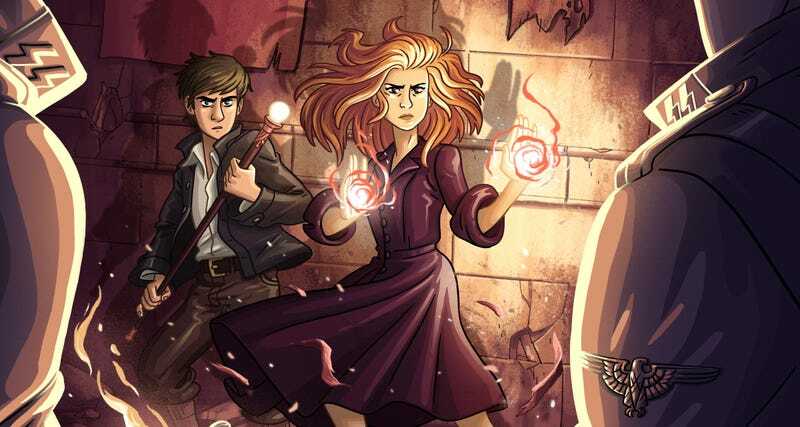 Think Harry Potter, Percy Jackson, and a wide range of heroes going back to the roots of the genre. TV Tropes lists the Chosen One as a “somewhat discredited trope.” With that in mind, I wanted to start with a Chosen One and do some new and interesting things with him and his role. The good news is that the readers loved the idea. As soon as my first novel, Tommy Black and the Staff of Light, was published, I had young girls and boys telling me that they wanted to see more of Naomi. Naomi is Tommy Black’s best friend, and, like Hermione Granger, she is a hard-working and astonishingly skilled magician. Also like Hermione, she has turned out to be a very popular character. Unlike Hermione, however, Naomi is all forward momentum, and as Tommy struggles with the unreliability of his powers in book two, Naomi shoves him aside and jumps in to save the day on a number of occasions. She is not the Chosen One, but as the series progresses she more and more fills the role. With that in mind, below is an excerpt from chapter twelve, where we see the above happening. It’s the kind of scene I would have loved as a young boy, full of action and magic. At the same time, it illustrates a key moment when the Chosen One trope is tossed aside. We were heading toward the north end of Denmark, and Naomi and I took up our customary positions of standing along the gunwale of the ship, surrounded by water as far as we could see. We spent a lot of time next to each other staring out at sea while we talked. I used the staff to reflect light off the caps of waves, and Naomi did her best to follow the sparkling light with a detonation that would explode into the wave. It was both game and practice. I lit the target, and Naomi blew it up. Naomi smiled. “Thank you, Tommy!” She opened her hand and looked at her palm. “But this spell is really simple. I’ve cast it so many times that I barely even think about it anymore.” She looked around and then whispered in a conspiratorial voice. “Want to see a really powerful spell?” Before I answered she had already conjured the black ball that she had said was the Hammer of Jamshid. Naomi lifted her hands, glanced back at me, and winked. The ball in her hand started to expand, and there was a snapping and crackling sound. It became a bit hard to breathe as I felt a pressure against my chest. Naomi then extended her arms and the swirling black ball shot toward the horizon. She had aimed it very far off, and it skimmed across the water, appearing to get larger and larger as it flew far beyond where I could make it out. A moment later a huge ball of shimmery light filled the horizon. Naomi turned back to me with a big smile on her face when a massive boom filled the air and I felt a whoosh of air push me back away from the gunwale. As I regained my balance a big wave slammed against the ship, knocking me off balance again. I had to hold onto the gunwale for support as the boat rocked violently as a succession of waves broke against the hull. “That exploded about a mile from here!” Naomi exclaimed, barely able to contain her excitement. “Wow. Exactly how powerful was that?” I asked, wondering if Naomi could flatten a city. “That definitely would destroy more than a city block,” I replied, which elicited more smiles from Naomi. Naomi shrugged. “The Hammer of Jamshid. I think I probably killed some fish. Sorry.” She didn’t sound very sorry. “You foolish girl! Do you not understand that these seas are teaming with U-Boats and German ships? You will get us killed!” Naomi shrugged. “I thought we were bait,” I replied. “Tommy, use your head. Just because we are bait doesn’t mean we want to be eaten by a fish.” Mister Ali looked at me and then Naomi and then back at me. Not seeing the response he wanted, he shook his head. I spun around and looked out to where he was pointing. Naomi did, as well. “I don’t see anything,” I said. “Just some seagulls,” Naomi added. Naomi glanced back out to sea, looking skeptical. “Against cannon fire and shielding a ship this size? That would require the Wall of Jericho, and it would take me an hour to cast that.” She faced the sea and called up the Hammer of Jamshid spell. The ball of destruction hovered in her hand. “That’s a great idea, Tommy!” Naomi said. I beamed as I held the staff up for effect. I didn’t really have to do that, but I found that using the staff that way intimidated and impressed people. With a thought I bent light around the ship. “Are we hidden?” Mister Ali asked. I looked at the staff. It was dead in my hand. Light was not bending around the ship. I hadn’t affected light at all. The staff had failed me again. I looked at Naomi, and I don’t know how I appeared to her, but she looked frightened. “It didn’t work?” she asked. I shook my head. Naomi clenched her teeth and turned toward the sea. “Mister Ali, tell me where the biggest ship is.” Her voice was all business. Naomi made a few motions, and I again felt my whole body compress, as if the energy of the spell was pushing against everything around it. Naomi extended her hands, and the ball once again flew across the caps of the waves. I watched as it let loose its energy near the seagulls. There was the loud boom of an explosion, and I knew a huge wave was going to hit us, as this was a lot closer than the previous casting of the spell. At that moment two sounds competed for my attention—the sound of machine gun fire from somewhere out at sea, and the sound of bullets hitting and ricocheting off the metal of the ship. Men scattered everywhere, while Mister Ali and I dove for the deck. Naomi, however, stood tall. I glanced up at her and she waved her right arm back and forth in a wide arc, as if she were a bull fighter, and the bullets were bulls. “I can handle bullets,” she said. The sharp clang of bullets hitting the ship turned into a soft thudding sound from right beyond the ship. Without any further delay, Naomi launched detonations at a speed that was otherworldly. I watched as both hands moved forward and back, balls of explosive light shooting out in a constant stream, each one a destructive spell that exploded in the distance. She cast them in a straight line, giving Mister Ali time to let her know how to adjust. Naomi shook her head. “Hold on.” With her left hand she made a series of movements. An orange light flickered and then she held her hand up above her head. “Is that?” Mister Ali asked, his voice full of awe. I didn’t even bother to respond. I connected with the staff. It was there. It was part of me. Its light shone within me. I could have cried out in joy at its return. The understanding between us was total. I filled the entire ocean, from horizon to horizon, with the blinding light of a thousand suns, shielding only those of us on the merchant ship. Naomi and Mister Ali were blinking their eyes. “Wow,” Naomi said, before turning to Mister Ali. “Guide me.” With her left hand in the air, she cast detonation spells with her right. “Guide me!” Naomi looked annoyed. “They are not dodging but moving straight to the left away from us. You are too far to the right.” Naomi moved and started shooting spells to the left, adjusting her fire after every few casts. While each detonation ended in an explosion, I could tell from the different sound of the last one that Naomi had hit her mark. “You did it!” Mister Ali exclaimed. Naomi dropped her hand and turned to look at me. I was shocked. Her hair was tousled mess, with strands sticking against her forehead and cheek, which were wet with perspiration. There were deep circles under her eyes. She started to sway, and I ran over and grabbed her arm. “Not bad for a girl,” she said before fainting into my arms. I held her while frantically looking around for a soft place to lay her. “Help!” I cried out. Mister Ali walked over and put his hand on my shoulder. Get Tommy Black and the Coat of Invincibility from Amazon, KOBO, Google Play and Apple iBooks.